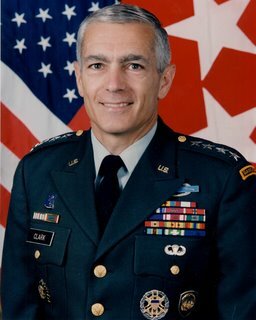 Despite a lackluster performance in the 2004 presidential election cycle, Wesley Clark has proven to be a man of uncommon commitment, which is perhaps not surprising from someone who was first in his class at West Point, a Rhodes Scholar, and NATO's Supreme Allied Commander in Europe. While General Clark appears to be positioning himself for another run at the Democratic Party nomination in 2008, he is doing so in a fashion that not only keeps his name relevant to political discourse, but in one that is marked by independent and reasoned thinking, as well as a true commitment to healing America from damage inflicted by the Bush Administration's fear-mongering jingoism. General Clark's website, in addition to petitions and calls to grassroots activism, features a section devoted to "ClarkCasts," which are podcasts of short audio presentations by the former NATO commander. Clark is not always at his eloquent best in this format, but his passion shines through whenever he talks about which path he believes America needs to travel. I think there are two clear paths ahead. This nation can listen to the dictates of fear and hubris as the administration alternately ignores Al Qaeda and then trumpets their success. Alternately brags about success in Iraq and then ignores it, and all the while beats the tom-toms for war with Iran. Yes, our country could slide that way if we listen to the dictates of fear. But we have nothing to fear in this country. We're still the greatest power in the world. And we can be the greatest force of good in the world. And we can keep ourselves safe. I'd like us to resolve on this 5th Anniversary of 9/11, that we as Americans no longer need live in fear. We should live in determination that we'll protect ourselves. Support our friends and allies around the world. Work together to solve the common problems that face mankind. And above all, we'll make sure that at home that we never sacrifice the liberties and rights that define our country. Even in an effort to protect ourselves. We can have it all. We can do it all. We just have to be courageous and face the facts as they are and work for the future as we want it to be. What is so remarkable about this passage is that Wesley Clark covers all of the bases that the Bush Republican Party would have the public believe it needs the GOP in power to cover, and does so not with fear, but determination. It turns the customary messages of dread and anxiety to which we have grown accustomed from President Bush and Vice President Cheney to one of positive, forward movement grounded in America's heritage. That is true leadership, and it makes the systematic exploitation of terror for political gain - of which we have seen far too much under this administration - look as small and grasping and futile and ugly as it really is. Will the Walk Be Walked?